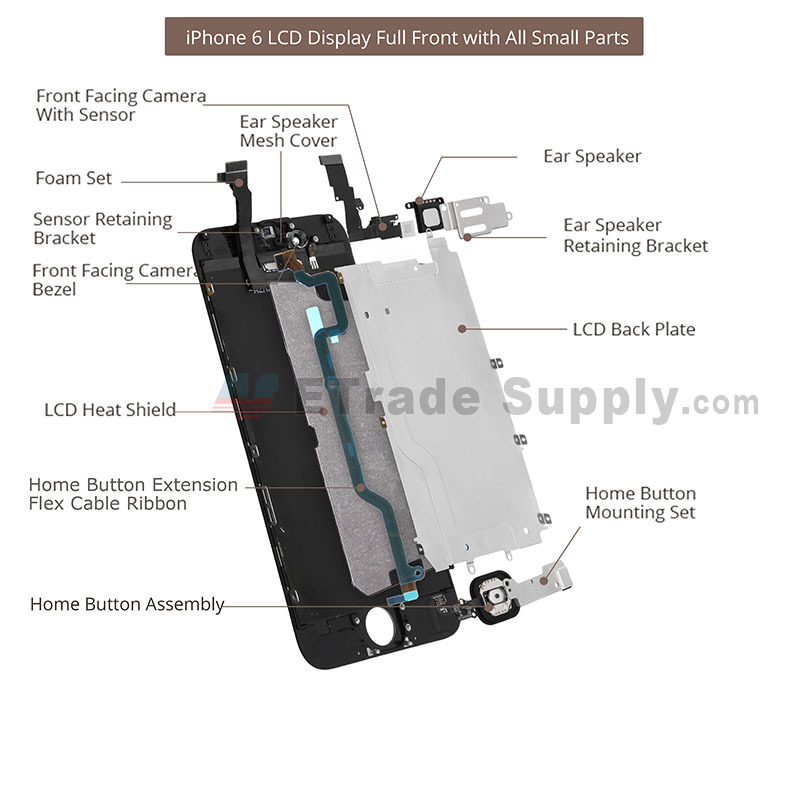 ● This iPhone 6 Screen Replacement includes the components as mentioned above. 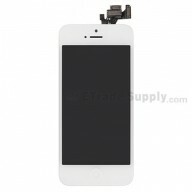 We can also supply the iPhone 6 LCD Assembly without Small Parts. 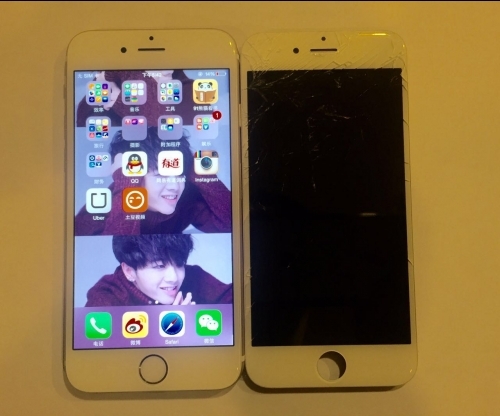 ● The Apple iPhone 6 screen replacement is available in black and white, this is the white one. 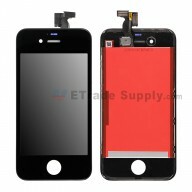 ● This iPhone 6 LCD Assembly is 100% brand new and original replacement. 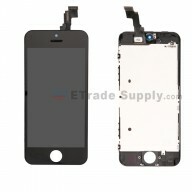 Please do not confuse it the non-100% brand new and original iPhone 6 LCD Assembly. 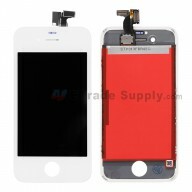 ● This replacement screen is compatible with iPhone 6 only. Please do not confuse it with other version. 1. 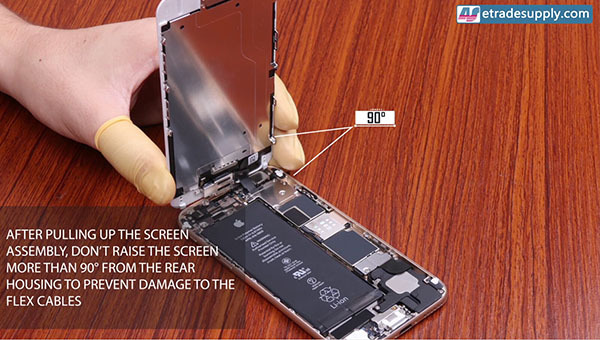 After pulling up the screen assembly, don not raise the screen more than 90 degrees from the rear housing to prevent damage to the flex cables. 2. 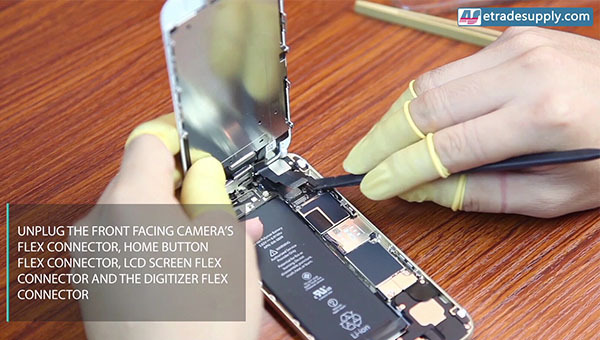 Unplug the front facing camera's flex connector, home button flex connector, LCD screen flex connector and the digitizer flex connector. 3. 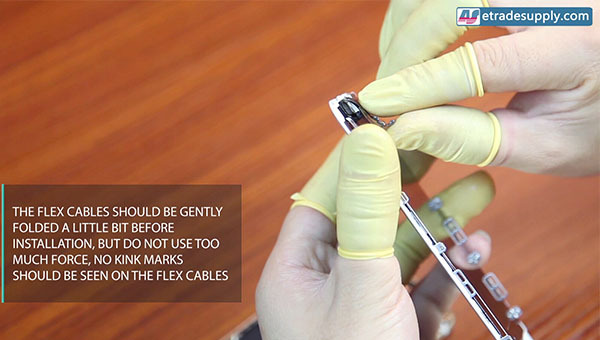 The flex cables should be gently folded a little bit before installation, but do not use too much force, no kink marks should be seen on the flex cables. 4. Do not force any IC located on the back side of the screen. 5. 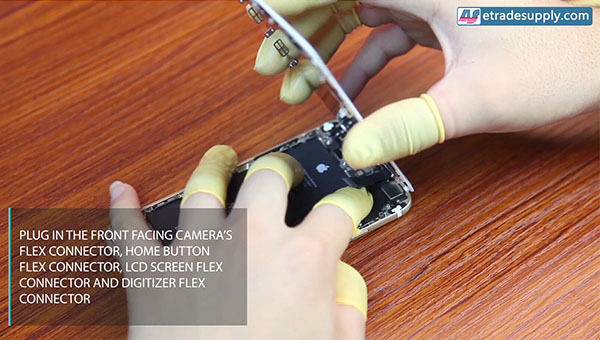 Plugin the front facing camera's flex connector, home button flex connector, LCD screen flex connector and digitizer flex connector. 6. 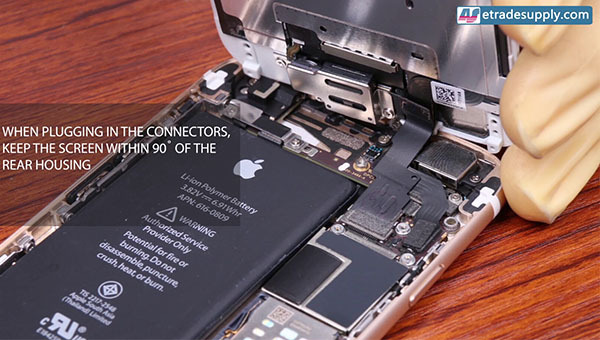 When plugging in the connectors, keep the screen within 90˚ of the rear housing. Perfect replacement screen for my Repair shop! All you need to do is swap the home button! Thanks for your kind review and support. We will keep on improving our product quality, service and everything. Problems i faced. the flex cable are short so when you open the screen again the screen is at 75 degree instead of 90 so its going to be a little tough to screw in the retaining bracket. 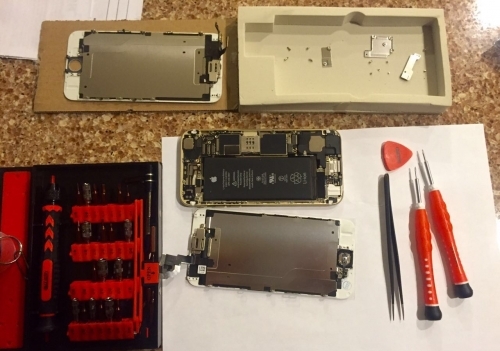 after installation the LCD Back Plate with Home button extension flex cable and LCD heat shield was a problem as the phone would keep on going in a restart loop and also the home button would not work for a hard reset. so had to change the back plate with flex cable and heat shield from the old screen to make it work. Over all the screen is good and very close to original. but not worth $72. [ ETS Answer ] Really sorry to hear that there is something wrong with the product you received. Once you have submitted the RMA Request in the system, we will immediately deal with your issue. and detailed descriptions to explain your claim so that we can process this issue more efficiently. The ribbon for the Home Button did not work, so I had to use the ribbon from the old assembly. Everything else worked perfectly. [ ETS Answer ] Thank you for your feedback and supporting! Well I expected the part from the US, but it came from Hong Kong. It was extrem well packed. Very Safe. I saw in first place that the screen is thin like the original one. But I haven't found any apple logos on the connector. There should be one! I was afraid that this is not an original one or maybe a wrong delivery. But I have to say the screen is brilliant. Very Sharp, very bright, very colourful. No reflection, blue shiny light, nothing. Completely original. 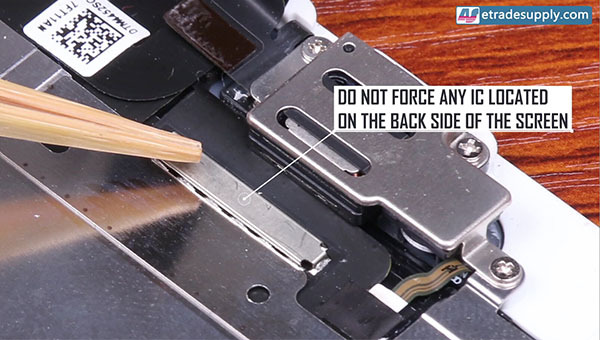 Please kindly check the apple logo on the flex cable, sorry for the inconvenience. Screen came in secure packaging, aiding with a YouTube demo for replacement, it works flawlessly, as good as new! Nice Grade A Iphone6 LCD screen, easy to fix. it take me about 10 mins to do it!!! !